The two days long Partnership Meeting of the Bangladesh Red Crescent Society (BDRCS) started today at Pan Pacific Sonargaon, Dhaka. Mr. Mofazzal Hossain Chowdhury (Maya) Bir Bikram, MP, Minister for Disaster Management and Relief was present as the chief guest at the inaugural session. The inaugural session was chaired by Mr. Hafiz Ahmed Mazumder, Chairman, BDRCS. Prof. Dr. Md. Habibe Millat, MP, Vice Chairman of BDRCS, Mr. Ikhtiyar Aslanov, HoD, International Committee of Red Cross (ICRC), Mr. Martin Falar, Asia Pacific Head of Operation, International Red Cross and Red Crescent Societies (IFRC) and Dr. Massimo Barra, Member, Red Cross Red Crescent Standing Committee spoke on the occasion. The welcome speech was delivered by Secretary General of BDRCS Mr. BMM Mozharul Huq, ndc. 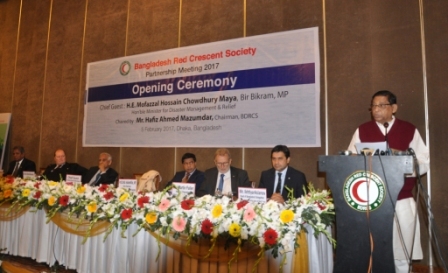 The chief guest stated that BDRCS is not only serving for humanity during natural disasters, but also in the area of human-made disasters and emergencies including `Rana Plaza Building Collapse’ and various fire accidents, launch capsizes and in political and social violence. BDRCS has been providing medical services, emergency cash grants and relief assistances aiming at championing disaster resilience and for the overall development of the community. He also mentioned about the Cyclone Preparedness Program (CPP), which was established in 1973 and being implemented jointly BDRCS and Government of Bangladesh. The programme has been recognized worldwide as the role model on disaster preparedness and management involving community volunteers. Representatives from ICRC, IFRC, 14 national Red Cross Red Crescent Societies namely American, British, Germany, Switzerland, Denmark, Bahrain, Sweden, Myanmar, South Korea, Turkey, Iran and Italy and representatives from different Ministries of Bangladesh Govt., Banks and corporate organizations, UN and NGO/INGOs are participating in the Partnership Meeting. It is expected that the discussion will focus on BDRCS new Strategic Plan 2017-2020 targeting to receive more cooperation and support from Red Cross Red Crescent partners and that of from national/international organizations.